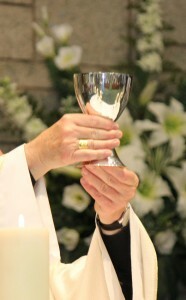 Young people attending an annual prayer festival in Walsingham, Norfolk, are today urged to profess their Catholic faith in “its fullness and with renewed conviction” by the Rt Rev. Mark Davies, the Bishop of Shrewsbury. In a homily at a Mass at the Searchlight@Walsingham festival, Bishop Davies will remind about 1,500 members of Youth 2000 of the reality of the Real Presence of Jesus Christ in the Blessed Sacrament. Bishop Davies will then invite the congregation to prepare for the Year of Faith, which will open in October, by heeding the words of Pope Benedict XVI, in his Apostolic Letter Porta Fidei, to recommit themselves to a life of Catholic witness. “Faith is choosing to stand with the Lord so as to live with him,” the Bishop will say, quoting the words of the Holy Father. Bishop Davies will say: “The Holy Eucharist brings successive generations to a moment of crisis, the moment of choice just as St. John describes at Capernaum. For Christ’s words addressed to the Apostles are now addressed to you and to me: ‘What about you, do want to go away too?’ (John 6:67). And we want to make the choice of faith echoing the words of Simon Peter this morning: we believe, we know you are truly with us in this Blessed Sacrament of the Eucharist, the Holy One of God.